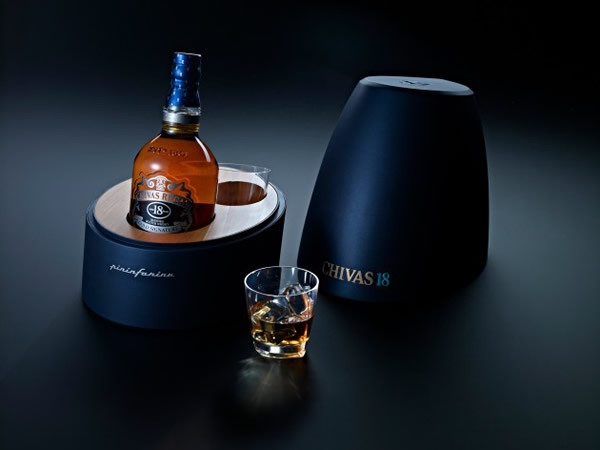 Chivas 18 and Pininfarina join forces to create three limited edition cases including a highly coveted Chivas 18 Mascherone by Pininfarina display unit. The combination of fine, aged scotch whiskey and a luxurious Italian eye for design creates smooth, appealing tastes for both palate and pupil. The first edition is based on a ‘streamlined drop.’ The outer cased is design in a rich blue with metallic finish that harkens to the metal coachbuild designs the Italian company is best known for. It incorporates a wooden veneer resembling the oak cases which Chivas 18 ages within and will cost $145. The second edition varies in only that it incorporates a ‘more aerodynamic shape.’ It includes two drop design glasses (above) and will retail for $585. The third edition, Chivas 18 Mascherone by Pininfarina, is the most elegant and has been hand assembled in Cambiano by Pininfarina. It is clad in aluminum and detailed with an oak internal structure, and is reminiscent of Pininfarina’s infamous innovative automotive designs. This edition is so selective that individual pieces will be made to order on request and only five will be on display globally. The pricing of the Chivas 18 Mascherone by Pininfarina is still undisclosed. The Chivas 18 by Pininfarina Collection will be available in numerous travel retail locations around the world, as well as domestic markets including USA, UK, Russia and China.